Meditation was never something that came easily, but like everything else worth hard work and determination, it has changed my life forever. I’m on a mission to get the world to meditate— in one form or another. I started five years ago and to say I would never go back to the way I handled my mind and emotions pre-meditation is not an exaggeration. This will be a part of my morning every day for the rest of my life. 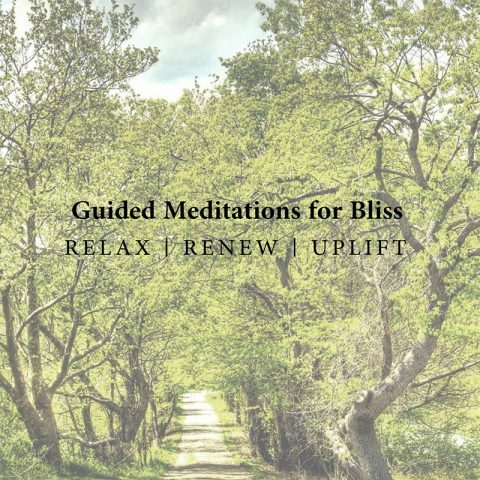 I made my first guided meditation album for all the folks who want to learn to meditate, but maybe were like me when I first started. I couldn’t sit still, I wanted so hard to be moved and go deeper, but everything that brought up feelings about “spirituality” or “new age-ness” made my skin crawl. As a teacher of the mind/body connection for the past ten years, I know it can be more simple than that, and that was my goal while writing and recording. I started practicing yoga in 1999, from the advice of one of my dance teachers who told me my scoliosis would become problematic later in my dance career as it had in hers. My first class was in a style of yoga that was very focused on the physical body and pushing its limits in complex poses (but always with an attention on the heart and a compassionate self-reflection). Coming from my dance background, I struggled with the need to get all “tricks” done well, and eventually was more interested in watching my”self” — mind and emotions — while attempting these superhuman physical feats, than I was in actually doing them. I continued in this lineage, and experimented with more yoga schools (you name it, I’ve tried it). I experienced styles like “vinyasa flow,” “slow flow,” all the way down the space/time continuum to “no flow,” with about eight other styles in between, pretty regularly, for about ten more years. 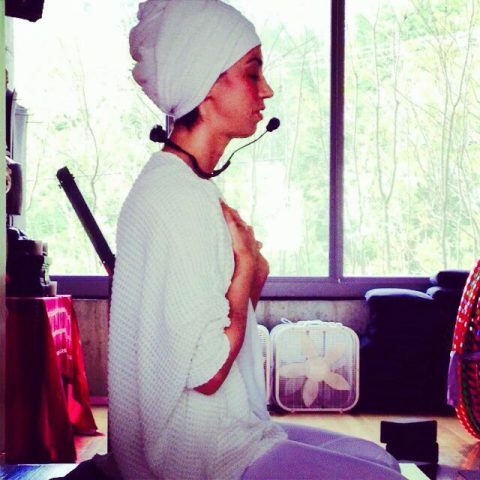 I sweated in 105-degree rooms, practiced sun salutations for two hours, and was able to perform “peak poses” like standing on my head, arm balances, deep back ends and more, but I was still searching for some “higher truth.” None of these teachings fulfilled me on every level of my being. There again, just being brutally honest. In pops something called “Kundalini Yoga.” In these classes, no ones’ eyes are open to applaud my efforts (feed my ego) and also I can’t compare myself to anyone? How do I know I’m doing it “right”!? I’m not sweating, but yet I can’t do any of the postures for as long as they’re telling me to. Lastly, I’m singing and breathing more than I’m moving in and out of big tricky postures. Is this real yoga? I was confused and uncomfortable, but by the end, was “vibrating” differently than I had ever felt before. I felt like I had back the peace and love that I had naturally as a child, but had managed to complicate and harden ever since. I found a buzzing of awareness in myself that was different than the “yoga glow” from any other class. I kept coming back for these strange experiences, and within a year, was in training to become a teacher: not caring about what the future held for me as such. I just knew I needed to do that work, and I need to do it… now. Through my studies since, I have found there is no one answer for everyone on this spiritual path of human existence. Every style of yoga fills its need in a persons life at a particular time, and there are no superior forms to others. Anyone who preaches “my way is the best way,” I politely turn away from and run in the other direction. What I think I want to affirm is that the point of ALL asana (physical) practice is to be able to sit, hold awareness, watch our breath, and be in meditation! That is (from my experiences) where the mental and emotional transformation exponentially increases. I had the honor of teaching in a group of remarkable teachers from all lineages at Kripalu’s Yoga Fusion during Memorial Day weekend, and I remembered on cellular level, that true yoga (union of body and mind) can be accessible from any place in life and hopefully with the right guide, in any style of yoga. My hope for my meditation album is to reach those that want a taste of this union, but maybe aren’t ready to go move into a cave to meditate twelve hours a day, or even start something as transformative as Kundalini Yoga. Just be you — wherever you are is the perfect entry point. dear you, you are a miracle.